Spirulina has a salty flavor, has astringent actions and is cooling in thermal nature, builds qi increases yin fluids, detoxes liver and kidney, builds blood and cleans the arteries. Spirulina is one of the few foods that supports all the organ systems. Like all chlorophyll rich foods, Spirulina builds friendly bacteria and inhibits the growth of fungus and other unfriendly bacteria and yeast. Spirulina has been shown to lower cholesterol, reduce liver fat, prevent tumor formation, enhance immune function, protect kidney from mercury toxicity, useful to treat obesity and aid digestion. The astringent actions of Spirulina include drawing together amino acids that aid neurotransmitter formation to increase mental capacity. Spirulina is a superior source of protein that is easily digested by the human body. 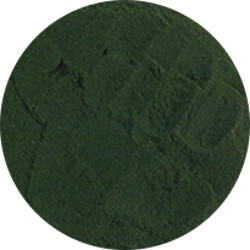 Spirulina is high in nucleic acid, gamma-linolenic acid, Vitamins B, C, D, E, iron, selenium and trace minerals.